Tannersville will apply for a $500,000 state grant to help rejuvenate Rip Van Winkle Lake’s shorefront and Gooseberry Creek. The village board unanimously approved five resolutions at its regular monthly meeting Tuesday to apply for the half-million-dollar grant through the state Department of State’s Local Waterfront Revitalization program. The village received a $150,000 grant from the Waterfront Revitalization program in January 2016 to help revitalize Main Street and enhance public access to lake. The village was rewarded a $500,000 grant in December 2016 to further develop the lake and erect a trail system connecting the lake to Main Street. Both grants were matched by the Hunter Foundation. 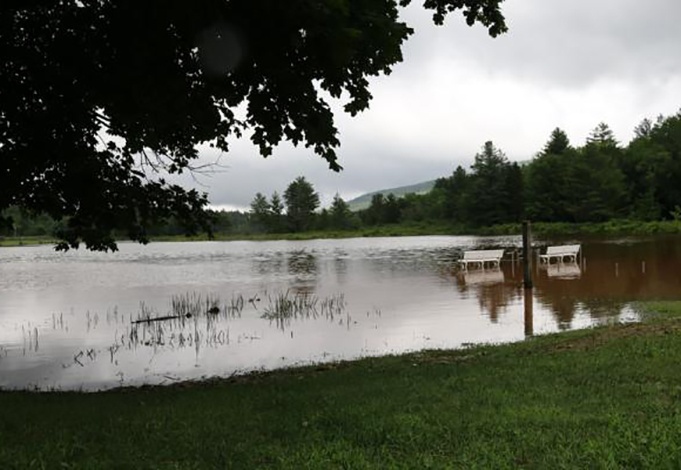 The village will apply for its third round of funding, which would be used to develop a strategy for the future use and development of Gooseberry Creek, Tannersville Mayor Lee McGunnigle said during the meeting. “We had a $150,000 phase — it was kind of like the exploratory engineering with some construction,” McGunnigle said. The project will restore 80 percent of the village’s water infrastructure, the mayor said. The revitalization project started two years ago. A full exploration of the lake needed to be completed for it, which included an environmental analysis of the lake, a plan to preserve it and to restore the beachfront, McGunnigle said. Other aspects of the project include infrastructure repairs to the lake’s water system. “We’re finishing that project and then overlaying the recreational piece which was the second and third grant opportunity to do recreation on top of our water infrastructure,” McGunnigle said. The village board wants Tannersville to become a walking community by having an unnamed pocket park on Main Street connect to the village’s parks, McGunnigle said. Larger municipalities may not act faster or be as flexible to become a walking community, but Tannersville can, Village Trustee George Bain said. “We’re flexible and easier to adapt,” he added. McGunnigle hopes the project will be attractive to people who will want to make Tannersville their home. Visitors experience more in the village on foot rather than when they drive straight through, Bain said, adding Tannersville boasts fine shops, restaurants and lodging. “We get people out of their cars walking around, they see a lot more of that,” he said. This vision ties in with expanding Tannersville’s bike paths including the Huckleberry Trail, which is planned to expand down to North-South Lake in Haines Falls, McGunnigle said. Visitors will be able to bike or walk to the village from the campground and vice versa. “It comes up with a lot of possibilities for people’s experience on the mountaintop,” he said.